This is an easy recipe for when you’re craving a decadent brunch, but too lazy to leave your apartment. It’s every bit as good as it looks and comes together in just twenty minutes – you could even make it on a weekday morning. Plus, everyone loves french toast. No need to take this recipe too literally – swap walnuts or pecans for the hazelnuts, use a grapefruit instead of an orange, opt for multi-grain instead of sour dough – you get the drift. Just make sure to serve with copious amounts of maple syrup and freshly brewed coffee. Note that if you don’t have zester, you can use a microplane/grater to zest the orange; to juice it, place a fork in the middle of the the orange then squeeeeeeeeeze. Happy brunching. 2. Whisk together the orange zest, eggs, milk, vanilla, cinnamon, nutmeg in large, shallow bowl. 3. Place the bread in the egg mixture and submerge. Let soak for about 10 minutes, turning halfway through. 4. Liberally rub a skillet or griddle with butter and canola oil and set heat to medium. When the pan is nearly smoking, fry the bread slices til golden – 2 to 3 minutes per side. If necessary, work in batches, adding more canola oil and butter as needed. 5. Transfer cooked french toast slices to a sheet pan and place in oven to keep warm while frying remaining slices. 6. 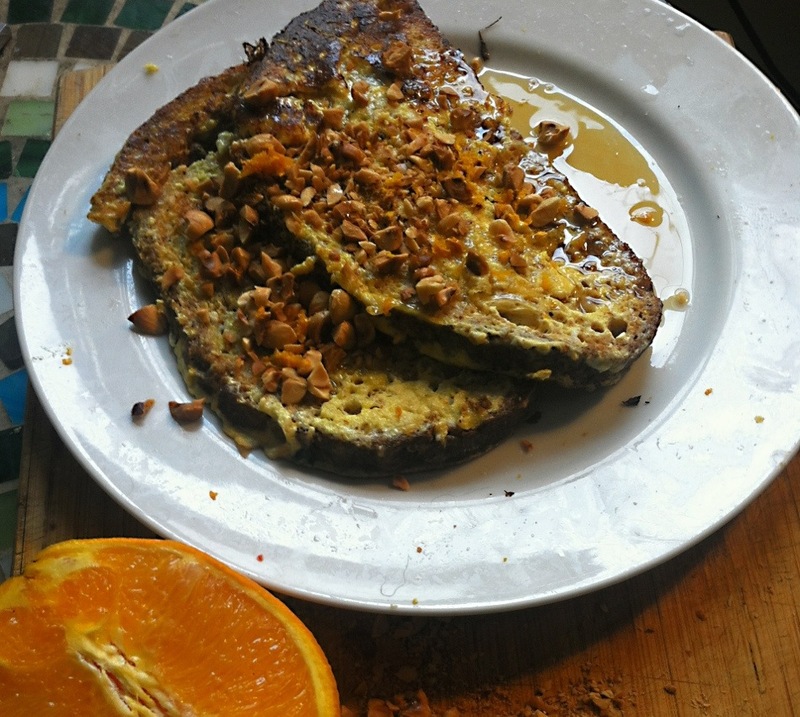 When all slices are ready, drizzle with orange juice and maple syrup and top with chopped hazelnuts.